Since 1945, the innovative approaches of a group of French scholars have profoundly altered the study of classical antiquity. Drawing on work in anthropology, religion, psychology, philology, and the new history, Antiquities offers major critical texts that have transformed the field of classics in the last half century. 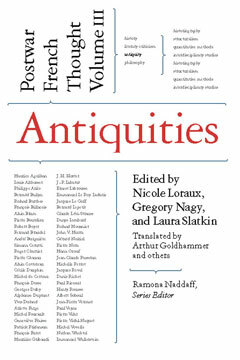 With seminal essays by Louis Gernet, Jean-Pierre Vernant, Pierre Vidal-Naquet, Nicole Loraux, Marcel Detienne, and their colleagues (many newly translated for this volume), Antiquities provides a rich perspective on society, politics, myth, gender, literary genre, and everyday life in the ancient world. An introduction and extensive notes explore the impact of a range of disciplines on these influential classicists’ thinking. Laura Slatkin is a professor at the Gallatin School of Individualized Study at NYU and a visiting professor in the Committee on Social Thought at the University of Chicago. She is the author of The Power of Thetis.